Nick Loper is someone who I met just recently at The New Media Expo in Las Vegas and he runs the popular site SideHustleNation.com where he teaches others how to build a sizable side income. What’s cool about Nick is that he built up his businesses while working full time just like I did. He’s got 8 different income streams and he’s a huge proponent of using your free time more wisely to achieve financial freedom. He also runs a popular podcast called Side Hustle Nation which you should all check out. So without further ado, enjoy the episode! You are listening to the My Wife Quit her Job Podcast. And if you are new here, it’s a show where I bring in successful bootstrapped business owners to teach us what strategies are working and what strategies are not. Now I don’t bring on these famous entrepreneurs simply to celebrate their success. Instead I have them take us back to the beginning and delve deeply into the exact strategies they used early on to gain traction for their businesses. Now if you enjoy this podcast please leave me a review on iTunes and please join me for a free live workshop on ecommerce which I give on a regular basis. For more information about the workshop, go to mywifequitherjob.com/workshop. And if you want to get a jump on starting your own online business, be sure to sign up for my free six day mini course, where I show you how my wife and I managed to make over 100k in profit in our first year of business. Go to www.mywifequiteherjob.com and sign up right on the front page. Now on to the show. Steve: Welcome to the My Wife Quit Her Job Podcast. Today I have my buddy Nick Loper on the show. Now Nick is someone who I met recently at NMX, and he runs the popular site sidehustlenation.com where he teaches others how to build a sizeable side income. Now what’s cool about Nick is that he built up his business while working full time, just like I did. And he’s got over eight different income streams and he’s a huge proponent of using your free time more wisely to achieve financial freedom. He also runs a popular podcast called Side Hustle Nation as well which you should all check out. But before he begins, just a quick note, you know kind of up until this point, I focused on guests worth seven, eight, even nine figure businesses, but today I want to kind of discuss some of the little things that you can do to make money, period. And Nick is an expert in this regard. So with that, welcome to the show Nick. How are you doing today man? Nick: I’m doing excellent. Thanks for having me. Steve: Yes, what is your story? How did you kind of get involved in Side Hustle Nation and what are all the various ways that you actually make money online. Steve: Is that right? Are you like over ten now, I mean double digits? Nick: Maybe ten, a bunch of different projects going on, but so my background was exactly like Steve said, trying to build the business part time. After graduation, I do what you are supposed to do. I got a corporate job, moved across the country, and pretty immediately found out that sticking around here for 40 years is a pretty scary preposition. And I really didn’t have the desire to climb the ladder. Even the vision or the desire to like see myself being a manager here, or like it just didn’t appeal to me. So I was trying to figure out, how can I get out of here? And the first business and painfully I actually started this even prior to graduation or as in affiliate marketing. And the site that I ended up having built was a footwear comparison shopping site. So it had been like a next tag or a price grabber, so specifically for shoes. And so the way the site made money was Zappos and Amazon and these other footwear retailers would pay a commission for any sales that were referred through the site. And aggregated all of these catalogues and you would say, if you are looking for Nike shocks, women’s model, xyz or whatever, you know here’s what you can find it and here’s the best deal. You know find my size or whatever the button said to click off to the matching site. Steve: Just curious, did you get stores to send you their product feeds, or did you manually gather all those for that site? Nick: So it was all aggregated through a handful of different affiliate networks. So Commission Junction was big, Link Share was big. Google affiliate network at the time and Amazon has their own product catalogue. And so the technical challenge was matching all those together and normalizing the data, because some people will say this is new Valence, some people will say this is new Valence Inc, some people will say this is new Valence Software and try to teach the system to say, “No, no that’s all the same brand,” and stuff like that. Steve: So Nick are you technical? I know we live in kind of the same area where there’s a lot of tech workers here. Were you in engineering at any point or? Nick: I’m not. I guess I saw a couple like IS classes and like one CS class. So you know enough to be dangerous, enough to speak the language, enough to be like well should your query really look like that. And the tech team is probably just annoyed at me at this point. They are like, “Look, we got it. Just stop bothering us.” So no, I didn’t program any of this myself. It was all just kind of laying out the specks and the groundwork for it. Steve: Okay, and then I remember just before we were chatting you mentioned you just recently shut this down. So I thought we kind of just go over some of the ways that you make money today. And so you mentioned now that you’ve hit double digits. So can we just kind of go over kind of at a high level what those are, and then we’ll just kind of focus on the ones that are making you the most money. Nick: You bet. So I was so involved in affiliate marketing even though the shoe business has– the sunset has fallen on a few business. We still have a handful of different affiliate sites that are varying in performance from very good to not so great. So that’s before the—what else is going on, like we’ve been to self publishing on Kindle and that’s been a really fun side hustle. I started that probably almost three years ago at that point. I remember getting my first like royalty cheque from Amazon for like $47. And I’m like, “I’m a professional author! Somebody paid me for my thing.” It was really cool. Nick: I’m doing some peer to peer lending which is not really a side hustle, but more of a alternative investment strategy selling some stuff on Fiverr which is the market place, because it serves starting at $5. After meeting a gentleman whose claim to fame was I have made enough money on Fiverr to buy a house in my first year. And I was like, “Tell me more. Okay, I’m saying this because I’ve been on Fiverr a ton of times as a buyer, but never really as a seller.” And so he kind of broke down what happened to get that. I thought that was really interesting. So that inspired me to get started there myself. I’ve got the blog and the podcast which makes money through referral sponsorships, affiliate stuff, sponsor posts occasionally. I run the Side Hustle Nation inner-circle mastermind and some coaching that happens through the site as well which is growing a little bit over the past year or so. That’s been a ton of fun. I’ve got some by the minute consulting on clarity.fm and I think you can set up a similar thing on Google help outs now which I have yet– it’s on my to-do list, just pretty fun building online courses through Udemy. I haven’t done any self post the ones I give, but I do the Udemy thing, testing that platform out. And just in the past year or so I’ve gotten a little more involved in freelancing both in writing and book editing. And then my latest is Amazon business. I’m starting out with some clearance arbitrage, and actually just made my first sales on that on Friday. Nick: It’s pretty cool. Pretty cool although refresh that app, or open that app and see actually numbers, not zeros in there. Steve: So let’s talk about your big money makers here. Now you mentioned a lot of stuff. What are like your top three money makers? Nick: So it varies month to month. You know when there’s a book launch going on, the Kindle stuff will rise to the top, but probably the affiliate stuff is consistently up there. Steve: Okay. And then which sites are you doing affiliate offers on. You mentioned it’s not like you had a lot of sites actually. Nick: Yeah, a handful of sites, so some of them do better than others. And actually lately the affiliates stuff through Side Hustle Nation has done the best. But the other site that’s done well is a directory of Virtual Assistant Companies or outsourcing companies, it’s called virtualassistants.com, and I started that in 2011. And that site is monetized with some cyber advertising, some referral like Regent [ph] for this type of companies. And then they buy the minute consulting stuff feeds into some of the clarity stuff. Steve: So let’s talk a little bit about that. So how do you create a site like that? How do you drive traffic to a site like that? So is it similar to your shoe site in a way where you aggregate different things, and you are making affiliate revenue off of it? Nick: So unlike the shoe site, this one where the shoe site was heavily relying on pay traffic and Google adwords and Bing search ads, this site is entirely organic search. Because our ranks are well for much of our outsourcing related terms and especially like long tail key words in that sense. So having had to do a bunch of pay stuff on upfront, but my inspiration for the site was like browsing. I had started a wine site. I don’t know why like within one country even though I know nothing about wine I thought this was good niche to get in to. And I saw this site. It was like a review site for these different wine clubs. I knew how much these wine clubs were paying out to affiliates sites. This guy must just be printing money. This is like the easiest site in the world to build. So I literally like tried thinking of what can I– you know you are listen to tropical MBA, what can I [inaudible] [0:10:19] in jam on this guy’s idea, and came up with the Virtual Assistants space. I work in—especially for software products that you can do this. The other one I wanted to build for ages is like the affiliate marketing—the email marketing version of this like the AWebers and the Getresponses and the Infusionsoft, all these companies, and a ton of them have like recurring payoffs it would be really cool to set this up. But that’s what I did. So I started using the exact same theme as that guy, starting out, use the exact same plug-ins, and just have somebody on Elance and then put it together for 50 bucks, a 100 bucks. Steve: So is it a WordPress site or no? Nick: Yes it’s a WordPress theme and just replaced the content with—content about outsourcing instead of content about wine. And it took a while to take out gain and traction, and I was stalking people on twitter to like—if they would tweet about the company I’d send them a note and be like, “Hey would you mind dropping in a review?” And that’s kind of how I seeded the initial reviews. Steve: That’s really interesting. For some reason I don’t see it mentioned in the Side Hustle Nation or at least maybe I didn’t maybe go through the material close enough. But so you just put up a site and you did some research on Virtual Assistants, and then you just started writing articles about it? Is that how you drive traffic to it? Nick: Yes a lot of it is based on my experience in outsourcing and trying to find assistants for the shoe business. So we ended up being a cool pivot because we were just trying to find out which of these companies overseas are legit and which ones are scammers and which ones are actually decent operators. And so now there’s like over 150 different companies with profiles on the site and close to a thousand user reviews. So it’s really taken off and it’s all user generated content that Google loves to chew on. Steve: So how do you get users to leave a review? Nick: Just at the bottom of every post. “Have you worked with this company? Leave a review.” And so initially it was reaching out to people on twitter, like if they mention this company, reaching out to the companies. “Hey if you have any happy customers, send them by to leave a review.” And you can kind of see based on the time stamps because it’s a marketing channel for the companies. So you can tell when they send out an email blast to their customers, and then you go like six within two days span or something. Steve: Interesting. And then what was your content base strategy for that site? Nick: It’s a couple of different ways. You know, one is kind of my personal experiments and trials and failures in outsourcing, and the other is just kind of news reporter style like who or when, where and why on different companies. Steve: And how often do you publish? Nick: It goes in spats. I go get inspired and do five posts in a two week span or something like that, and then do nothing for a month. Steve: So do you have anyone who manages the site or is it mainly your content? Do you have writers or–? Nick: Mainly my content. Have you used—I mean I’ve tested several different writing services. So I can profile them on the site. Like Iwriters, I’ve gotten articles from Fiverr, I’ve gotten articles from Copywriter today, Textbroker, all those places. Steve: For some reason whenever I think of Virtual Assistants these days, I think of Darker’s site. Nick: He’s on it. He’s on there. Steve: No I would imagine that you are kind of competing against the guys like Darker who are putting out content—not competing, that’s maybe the wrong word. But I guess you are outranking guys like Darker and then you’re referring traffic to his services. Is that kind of accurate? Nick: Yeah, probably not outranking Chris, because he’s got his whole empire built up. But he’s only one out of 150 companies. So there’s plenty of other options that people are looking for answers on. Steve: Okay. And so your basic strategy there is to pump out content, get the content ranking for long tail key words, soliciting reviews by just soliciting some of these companies for their positive reviews to put on your site. And so everything is pretty much organic? Nick: Everything at this point is relatively hands off. And now what I’ve started doing is you know recording video interviews with the founders and doing trials of the services myself. So I’ve got that kind of firsthand content to put up there as well. Steve: Okay, so you have that site which sounds like it’s more or less on autopilot. What are you actually actively working on right now that is generating a good amount of income? Or what are you excited about right now? Nick: I spent a lot of time on this Side Hustle site. It’s a very content intensive content revenue, writing the posts kind of the case studies experiments that go into those, recording the podcasts and doing that sort of thing. Lately, the past couple of weeks, I’ve spent a lot of time trying to learn the Amazon business, the importing business just because it’s such a hot side hustle right now, it’s such a hot business that people are interested in. And I’ve been probably ignoring it for too long. And I need—because of the nature of the other site, I need to be able to speak intelligently about it. Whether it works or not, I need to at least have an experiment to write about. Steve: I see. So let’s talk about Side Hustle Nation real quick. So how does Side Hustle Nation generate income, and how does the podcast kind of all come into play here? Nick: Sure a couple of ways or several ways. So there is services like you can hire me for side hustle coaching. There’s a private mastermind that I host. The site runs money through affiliate revenue and some sponsored content. Steve: Okay and then give me an example of one of your affiliates. Nick: So I’m an affiliate for Blue Host and I’m not putting up [inaudible] [0:16:21] numbers, but occasionally generate sales for that. One of my cool like examples is my friend Sean Marshall came on the show like in January, February. And he’s like, “Hey, this is my business kind of open the Commono [ph] on. This is my business. I run a local marketing support for local businesses to the point where it’s an amazing lifestyle business. I up and moved my family to Cozumel Mexico and we are Scooby diving and the girls are learning Spanish, it’s great. And by the way I have a Udemy course on the topic. It’s 75% off for your listeners. And so when we affiliate linked that, you know after 30, 40 minutes of him delivering the content, they converted really, really well. So those are kind of affiliate relationships that perform best on the site more so than the Blue Host stuff. Steve: And you said a bunch of stuff there. You also mentioned some sort of membership site or mastermind. Is that what you said? Nick: Yeah. So I host a quarterly mastermind, five or six people at a time. We meet, we agree to talk about side hustles and accountability and goals for the quarter. Steve: And these are people that pay you on a monthly basis? Is it like a subscription or–? Steve: Okay. So how did you get those customers? Are they just people who follow your blog or–? Steve: I see. How much do you charge for that? Steve: $97 a month and then you take what, five people every month or so? Nick: Yes, there’s actually two groups going now. So I have ten people in there. Steve: Interesting. So how did you come up with the idea of doing that, and how do you kind of run things. Nick: This was an idea from Alex Parker actually. We were recording a session last year on the topic of masterminds– the importance of masterminds and more so like the ability to host paid masterminds. It was something I never had even thought or heard of before. And he was like, “Nick, you have a relatively decent following. The Side Hustle Nation people would love to hang out with you.” I said, “Okay, well let’s see what happens.” Put it out there and you know had eight, seven, or eight enquiries and founded a pretty solid crew there. Steve: Interesting. So you just put yourself out there and then you got five people to sign up. Are you actually present during these? Do you moderate all these discussions? Nick: Yap. I’m on every call. Steve: Okay. Is it just like one gigantic Q&A session or how do you run it? Steve: So these guys – you meet with these guys once a week for a month. And then are you ever in the hot seat or is it just primarily for the people who pay? Nick: Yeah, just for those guys. Steve: I see. This format sounds exactly like the other masterminds that I belong to. It’s just funny though that you’ve—it’s creative that you’ve monetized this actually. So do you find that the people that you attract, are they all trying to create blogs or is it just kind of all across the board? Nick: It is across the board, more — a couple of people also probably doing ecommerce business, since that’s kind of hard right now. A lot of the people in the authority business space and kind of building their personal branded blog, and I want to be known for this, I want to start a podcast, I want to be known for this. Steve: Okay, and so right now it sounds like you have 10 people paying you $97 a month for this? Okay, and then you also mentioned Udemy, so for the listeners out there Udemy is an online course platform, can we talk about what type of courses you are offering on there, and how much that generates approximately? Nick: Sure so I — my main course is on how to rock your kindle launch, how do you rock your book launch basically, especially for like first time author, nonfiction, here is the system that works. The course was created after I put up a guest post on Steve Scott’s site, yeah, and it was like really like in terms of like 5000 words guest post. I got a ton of love on social media, a ton of love in the comments, and people were like you are joking, hey this could be a book in itself. And so I realized okay, there’s an appetite for this kind of information, how can I expand on this? And I had been wanting to try Udemy, I decided to interview people like Scott Braden and Rob Cabin [ph] and we were having a ton of success on this, like okay I got to give this a shot. Steve: On Udemy you mean? Nick: Yeah, I said man this is — I don’t know maybe I just didn’t just do it right or whatever, so I kind of studied from these experts on how to launch it a little bit better. What worked best during the launch actually, so Udemy is a lot like Amazon, like if you can provide that initial push in terms of traffic and enrollments and sales and reviews, then their internal algorithms start to take place, like if you can provide that initial push like with your book to climb the ranks, then all over sudden it’s on the best seller list, and people will find it organically. Similar with Udemy, and so in the first couple of months after the launch, this course generated maybe 3,500 bucks and then it’s between 3 and 600 a month since then, so relatively and passive since then, so I made it in November and haven’t touched it since, so it’s been kind of a cool. Steve: So what is the main difference between your failed launch versus your successful one? Nick: Okay, so the biggest success driver for the more recent Udemy launch was finding a couple of high value affiliate partners. So Udemy has an affiliate program through LinkShare that is I think a 40% pay out, and then if you are a top performer you can ask them to like bump you up to like 50%. And what that will do, so somebody could get 50% of your course for selling it for you. And so in my case that was Steve Scott, so he had built up a good report through that guest post and some other channels and hanging out at New Media Expo and all that. The other was Spencer Hass from Niche Pursuits. And so in Steve’s case, it was like I have referred — I referred ten people to your post all the time and they ask me how should I launch my book, and it seems like it would be great to have this page thing to recommend and get paid on. And in Spencer’s case, him and his partner parent had been working on some kindle projects kind of like quietly behind the scenes and so I knew they were working on that, because I’d been following their stuff for a long time. You just send them early access to the course; hey I know you guys are working on this, check this out. And so they were very-very generous when they did their book launch recap report like, hey we owe Nick a huge thanks for teaching us all this stuff, and that was a great endorsement from both of those guys. Steve: I see and how much do you charge for this course, how does like the pricing and your cut, what does Udemy take as well? Nick: So I set it at $99 initially, and since bumped it to 149. I should probably bump it to 199. So how Udemy works is a very discount driven platform. And so with the courses that were sold through Spencer and through Steve were priced at $24. It’s like hey, get 75% off through this affiliate link. And that means my cut on it was $6 to $12 depending on how the structure is set up. So not a huge, not like the $2000 super premium courses that are out there, but an interesting channel. The reason people go to Udemy, a couple of reasons. For traffic that you refer as the instructor they are going to give you 97%. So you could theoretically put your course up there for $500. And if you have that audience to sell to, they are going — and you don’t have to worry about video hosting, you don’t have to worry about payment processing, you don’t have to worry about any of that stuff. And if you are going to drive all those sales, sell it all day long for $500. You can also opt out of their promos to say like when they run like their monthly — because I launched right before in November, like right before black Friday. And so they had a big whole like black Friday thing, so everything was like $15. Steve: Like every course on Udemy was $15, okay. Nick: Yeah, and which was cool because it sold a ton of copies and it was all theoretically incremental, but it was also like if you have like some super premium material, you wouldn’t want to discount that to $15 either. So you could opt out of that. Steve: Interesting, so yeah I do notice those coupons flashed by and it seems like everything is always heavily-heavily discounted on Udemy. I’m Just curious why Udemy versus your own platform? Nick: Okay, so the second component of that is like Amazon, here is an opportunity to reach a platform of 6,000,000 students versus how many people you talk to on your blog, podcast, email list. It’s from that 6,000,000, and so if you can hit this right for your target key words that’s kindle publishing, that’s self publishing, that’s kindle launch, that’s book launch, whatever it is. If people are sourcing for that, you have the opportunity to reach a much wider audience and that can be — and some people are using it purely as a discovery platform. They’ll put my course up for free; the minimum course is 30 minutes. And now I can funnel those people, I can send educational announcements to those emails or to those people which generally pings their inbox. And basically it’s an exposure challenge for a lot of people. Steve: So that’s interesting, so you can list your course on there and then once people sign up you have access to their emails at that point? Nick: That’s a good distinction to make, you don’t have their email, you can message them on platform, and you can send them either educational announcements, or promotional announcements. And I think you are limited to like four promo announcements per month. Steve: Okay, that is really cool, and so let’s switch gears a little bit, because I want to kind of go through a little bit of list of all the ways you make money. I’m really curious about Fiverr; I don’t see how you can possibly make significant money with that platform. You are making five bucks or so off a customer right, so how does it work? Nick: So Fiverr works like this, it’s all about the up sales and the $5 gigs are all about the pre made files, you can just hit send on basically. So it’s just like selling a book or a course, it’s no — there’s no work required to send this. And that’s what the guy in his screening was AnarchoFighter if you want to look him up one of the best Fiverr sellers on their top rated seller. So he said hey, all my $5 gigs are just PDF, video, audio file deliveries real quick. I followed the script he had sent two seconds. If somebody wants my actual time and involvement, that’s when it’s going to be into the gig extras, the up sales and stuff. So one of his — they had — last we spoke was like I’ll send you the seven steps secret to a killer auto responder or something like that. And there was — in the up sales I will write message number one for you, I would write message number two for you, I would write the whole thing for you. As he is upgraded to like a top level seller like he can charge, I don’t know up to 100 bucks on extra or something like that. Steve: But he still has to manually respond to each one of these request right or no? Nick: I think at that time definitely yes, at this time they may have added like a quick delivery like so somebody orders just the basic, and it’s just like a file you can paste in. Or like you can have it set to auto reply a certain script, and here is the Dropbox link to download the file or something. Steve: Okay, and then I think I read one of your posts that you made several thousand dollars on Fiverr? Nick: Yeah, I was doing around 500 bucks a month during my first year on the thing, so that was pretty cool. I did do some manual labor for part of that, how did it start? I started selling a couple of eBooks that I had, and they’ll say well, but then I got brave and said I’m going to turn on the screen recorder. I’m going to look at your website and for five minutes I’m going to just tell you what I think about your website, how you can improve your SEO, your conversion, your usability well. And that gig did okay; I got a couple of orders here and there. Probably three or four, five months after I had it live, or I wake up in the morning I’m like flooded. My inbox is like flooded with Fiverr orders, I’m like what is going on. In short if I log on to a website and I see my mug on a homepage, I’m like oh my God, what am I going to do? Steve: The homepage of Fiverr? Nick: Yeah, the homepage of Fiverr just top 50 or top 100 site in the world, like very high traffic site. And it was a ton of fun and it ended up being okay, hourly maybe 20 to 30 bucks an hour with up sales and extras and everything. That went on, plus you meet some cool people on the platform just because it’s such a high traffic site, like I met coaching clients, I met mastermind members, I met bestselling authors. It’s kind of weird who’s on there on Fiverr, but it’s a really cool, I look at it as kind of a fun platform to play around with. I definitely wouldn’t go there if you are trying to purely make dollars, and there’s a million people out there trying to teach like Fiverr arbitrage, and do all this nonsense. I’m not really doing any of that, but one way to think about is if you do have a larger service that you want to sell or similar — even a digital product, perfect for digital products, they have a larger service. Think of like what’s a bright sized like gateway drug that can get people into your service. Some people are doing — graphic designers are out there doing like little Fiverr cons for people’s websites and stuff like super quick, super easy as of entry point. Steve: Okay, hey, just talking to you for like the last half hour, it seems you get a lot of stuff cooking in the oven. Whereas if I look at myself I can barely keep up with like the 2 or 3 websites that I’m doing, do you ever find yourself overstretched. And what is kind of your view on focusing on one massive money making project versus lots of little ones? Nick: So I was massively focused on shoe business for a lot of years. And that was probably good at the time, but also there’s some risk in that right? Same thing if you work in a day job, if you are relying on one source of income for your livelihood, that’s an inherently risky position to be in, because Google can shut you down at any moment. Steve: So they shut down your Adwords account or what happened? Nick: Yeah, they shut down Adwords and so overnight 80% of traffic revenue was gone. Nick: And it was a battle, it was a struggle to kind of get that back going. And eventually they said oh, looks like we made an error, like 2000 is really expensive error, but thank you, for turning me back on. So that’s where kind of the desire for this diversification comes from. Well, I’m totally with you and if I try and focus on one thing at a time, but I have got to have, I don’t know, I have a little bit of ADD too, it’s like I’ve got to have several things going on, so I’m not going get bored. And so I try and preach diversity a little bit or diversification. Steve: So I know a lot of the listeners, at least a small sub set of them are just trying to make money in any way they can, whether that be in ecommerce or side hustles and that sort of thing. So for someone who is just trying to make money as soon as they can, and you got a lot of experience in doing a whole bunch of different things, what would you say is probably the best way to start? Nick: Start out by selling a service, you don’t have to worry about building a website, or having a product, or having an audience, or doing any of the stuff. Like you just need some skills that you have, some service you can offer and customers know what they want. I think Bryan Harris puts this really-really well, and say, hey look this is the fastest, absolute fastest way to get started. And he goes into detail in episode 87 of the side hustle show, on how exactly to get that done, reaching out to this target list of customers and offering something valuable to them for free in advance just to start the conversation, and go from there. Steve: So let’s talk about that a little bit, so I’m just — in your opinion let’s say you have the skill, what is your next step? Nick: So in my case I have been doing some nonfiction book editing, specific like business book editing. So if I wanted to grow this and kind of add capacity, but if I want to grow this what I would do is look on Kindle, look on Amazon for some business books. And I found one the other day that was like just atrociously written and formatted, because it was actually repurposed from like Udemy content, it was very clear like, oh I just hired a transcriptionist to like transcribe my video with no — didn’t care about sentences ending in periods, they didn’t care about spelling, it was just like horrible. I said man this is your — you are signing your name to this, this is your brand. And so what I can do is take screen caps of that book, read, pin it up, and like look these are all of the errors I found just in the first chapter. Like let me clean this up for you and especially mister Udemy instructor you’ve got ten different courses, I know you are going to repurpose all of these over to Kindle. So that would be a perfect client team to land in the early stages. Steve: So you would reach out and you would contact an Amazon author directly? Nick: Yeah, so I would reach out to the author, I would just figure out their email address or website or what I know, probably first name at website name.com usually. You can try to look it up on reporters see if you could find somebody that way and say hey, mister author, I was checking out your book, thank you so much for publishing it, great content. However there’s — I don’t know if you had this proofread or not, because clearly you didn’t. I noticed a ton of errors, here is just what I found in the first chapter, my editing rates are blah, blah, blah. I don’t know you just want to start that conversation and see if there’s something that would be interesting. And you could even go the — you could kind of instill some fear like, hey this is going to hurt you in the reviews which is going to hurt your sales, it’s going to hurt your credibility, like you are leaving money on the table by not investing in editing, whatever. Steve: Okay, have you tried this tactic before in the past? Nick: I have done it, I haven’t done it on this particular author that I have one. And in that capacity with all these other stuff, but that’s how I would go about it. Steve: Okay, and then — so you have this first client and let’s say you do a good work, what’s the next step after that? Obviously you can’t go and keep scrounging for clients this way, right? In the long run it’s not scalable is what I should say. Nick: What is and it isn’t; you don’t need that many, like if your goal is to make a thousand bucks a month, your goal is to replace your day job income, like you can absolutely get there this way up to your hourly capacity. And then it’s a matter of raising your rates and things start to snowball from word of mouth from that point. Steve: Okay, and so it sounds like you’ve got a bunch of gigs where it requires your time, and then you also have a bunch of different passive sources. What is kind of your philosophy in balancing those two? Nick: What’s kind of funny because somebody asked me this the other day and what percentage of your income is passive? And I was like well, I don’t know, let me add it up, and so it was probably 70% or 75%, but at the same time, almost all of my time is — a decent percentage of my time is dedicated to building those passive assets. So it’s like does that really count as passive? Because it’s like every time you write — it takes a month to write a book and then, but after that like that can be a passive income asset, so it’s like, is that—does that count as passive or not. So there is two sides of it, I think there’s the speculative investment in putting that time to create that course, to create that book, to build this authority blog or whatever you want to do, that may never pay off. Or if you really want to bring the cash or just in a hurry I go the freelancing route of selling some service. Steve: Okay, then and that example that you just gave regarding the editing. How would you conceivably turn that into something that was a little bit more passive in the long run? Nick: So what you would do, I mean the productization opportunity would be to hire editors underneath you, would be to build a software like Grammarly or something like that, I think like machine learning somehow automate that. You could throw on some insularly services like oh, we are going to format this for — CreateSpace. We are going to help you with your launch — we are going to recommend cover designers and collect fees on referrals or something like that. So a bunch of different ways you can do add on services. Steve: Okay, cool and then what — I meant to ask you this, what is like the kind your Side Hustle Nation podcast come and do all of this? Does it generate income directly, and how do you kind of track the effects of having a podcast on your overall business? Nick: Podcast has been the number one growth driver; it’s absolutely the highlight — absolutely the highlight of my week. It grows – it’s probably grown twice as fast as blog leadership just in terms of downloads and reach. There may be a common theme to all the stuff we talked about, whether that’s leveraging these existing platforms, leveraging Amazon, leveraging Udemy, leveraging Fiverr, and iTunes is one of those platforms. When I started my podcast I had email list of 11. There was no audience and it just — and being happy with every small milestone along the way. But it’s grown like crazy and it’s just been — the feedback that I get makes it totally worthwhile. What I have been doing too — and this is kind of the secret source for podcasting is content marketing because I realize I’m never going to have Johnny doing this. Download numbers, sponsorship numbers, and on top of that it’s a weekly show rather than a daily show, the numbers are just are never going to look like here is the sponsors. And so there was a light ball moment, they said look this is just content marketing for Side Hustle Nation, for services, for affiliate stuff, whatever. That’s going to be– like the goal of the podcast should be to get people on the email list. And so I started creating these episodes specific often and offer a free show, which takes, admittedly takes more time, but you almost have to do it like the results are just night and day and these things convert like crazy, and so I plug it at the beginning and end of every show. You could do this, you can put together an action guide, you can put together like the checklist, you can put together the transcript to give away. What I do is like the extended show notes, I call like the highlight real. This is like the sports center version of the podcast and you can grab it at sidehustlenation.com/whatever. Plug that the intro, outro, and these do really-really well. Steve: I see, so it’s like a content specific bonus except for a podcast as opposed to a Blog post? Steve: Okay and then what do you do with these subscribers once you have them, like they are all signing up for different reasons, right? How do you market to these people on your list? Nick: So one core thing, so I do create a separate sign up form for each week. And so you do get some tagging, this is where it was little weak. You do get some tagging on what they were interested in. Okay, they opted in an episode about Amazon FBA, that’s great intelligence to have. Unfortunately people can opt-in for as many of these as they want and it’s just like file delivery mechanism after the first one. And so you don’t have any data on what else they signed up for, but you do get the first one which is valuable. So you can segment if you have a special offer, special something, hey this could be interesting specifically to the Amazon FBA people, specifically to the Kindle publishing people, like that’s great to have. So you can segment to those people who have a little more relevant email. Steve: I’m just curious for a lot of your affiliate stuff, is it primarily driven through email or through your post on your blog? Nick: There’s– so like the Bluehost stuff is primarily driven in other kind of like web services stuff. It’s primarily driven through the blog. Anything that’s side hustle specific, or like people’s courses and stuff does much better through email. Steve: Okay, cool Nick, hey, it was great chatting with you today, we’ve already been chatting for quite a while. If anyone is interested in Side Hustle Nation and any of the other different income sources that you talked about today, where can people find you for questions? Nick: You bet, nick@sidehustlenation.com if you want to send me an email, or would love to have you stop by the side hustle show. Check it out new side hustle, new part time business ideas every week. Steve: Awesome, hey Nick thanks a lot for coming to the show man. Steve: Hope you enjoyed that episode. 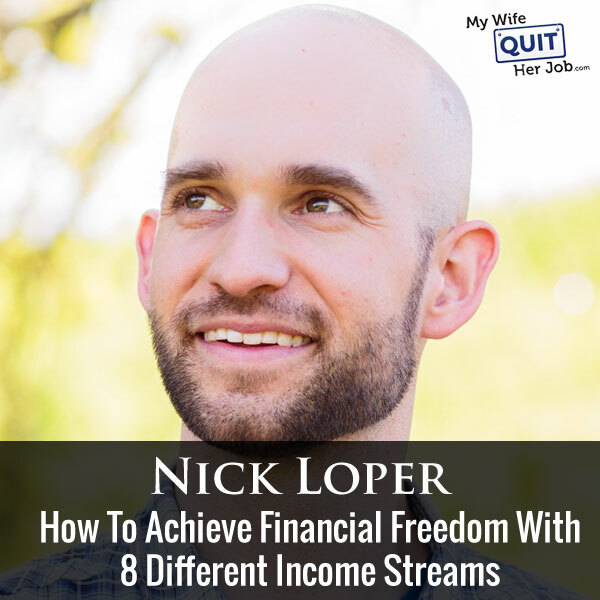 I really like Nick’s initiative and how he has managed to create such different and diverse income streams for himself in order to support his family. For more information about this episode go to mywifequitherjob.com/episode80, and I just want to remind everyone that I’m now offering free ecommerce classes now on a regular basis. So if you are interested in learning more about selling online, please sign up at mywifequitherjob.com/workshop. And if you enjoy listening to this episode, please go to iTunes, do a search for My Wife quit Her Job and leave me a review, because when you write me a review, it not only makes me feel proud, but it helps keeps this podcast up in the ranks, so other people can find this information, find the show more easily, and get awesome business advice. It’s also the best way to support the show, and please tell your friends because the greatest compliment that you can give me is to provide a referral to someone else, either in person or share it on the web. And if you are interested in starting your own online business, be sure to sign up for my free 6 day mini course where I show you how my wife and I managed to make over 100k in profit in our first year of business. Go to mywifequitherjob.com and sign up right on the front page, thanks for listening. Steve, thanks so much for having me — it was a ton of fun! If anyone has any side hustle-related questions please feel free to reach out! Great interview (as always), Steve! Nick, I’m an avid listener of your podcast and really appreciate the work you do and wealth of information that you bring to your listeners. Thank you! Look forward to loading on Casts podcast app on my phone – do you know when it will drop?